LEXINGTON, Ky. (Aug. 9, 2012) — Twenty girls from grades 8-11 spent a week on the University of Kentucky campus learning about underwater robotics from UK College of Engineering faculty, a Lexmark engineer and student mentors. 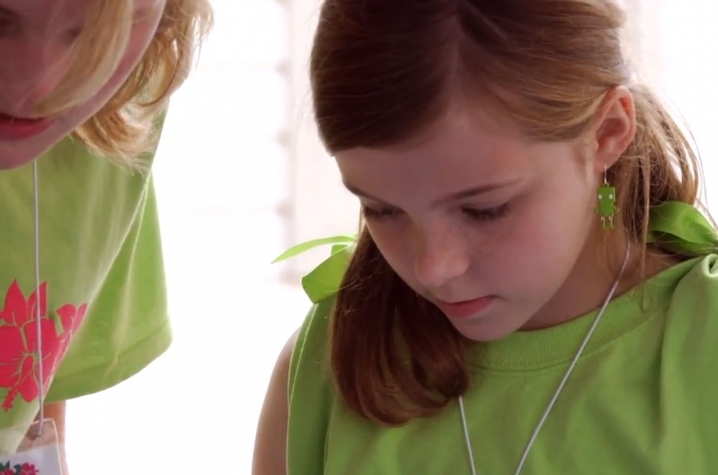 The girls, ages 12-15, worked together in teams of five to design, build, program and test their own robots, using the Lego Mindstorm system in Kentucky's first-ever "Aquabots" day camp. Teams were challenged to get their robots to succeed in completing certain "missions" throughout the week. The camp was one of several camps across the country that is modeled on a shared "Waterbotics" curriculum designed to promote interest and enjoyment of science and engineering study in junior high and high school students. The Aquabots camp was a joint project by UK and the Kentucky Girls' STEM Collaborative, with support from the Cooperative Extension Service, 4-H Youth Development, and was coordinated by UK's AMSTEMM program, which serves those students who are underrepresented in the science, technology, engineering and math (STEM) majors. "The purpose of bringing girls together is to really try to interest them in science and engineering careers," said Sue Scheff, AMSTEMM director. "With the Kentucky Girls’ STEM Collaborative, this is one of our goals, to reach out and encourage girls, and their parents, teachers and counselors in the schools, to consider STEM careers." Scheff said the camp was an "overwhelming success" this first year, and plans are already under way for next year's camp. The Waterbotics curriculum is supported in partnership with the National Girls Collaborative Project (NGCP) and Stevens Institute of Technology's Center for Innovation in Engineering and Science Education, which is supported by a grant from the National Science Foundation. Additional sponsorship support comes from Lexmark and Lockheed Martin. More information about the UK Aquabots Summer Camp is available online at www.kygirlsstem.com/ProgramsEvents/ProgramForGirls.html.